The 20th and final gas engine has been delivered to the site of the 190 MWe/192 MWt K.I.E.L. 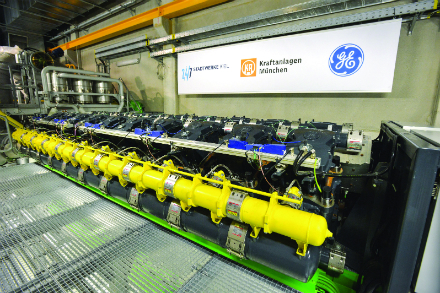 (Kiel’s intelligente Energie-Lösung) coastal power plant, billed as “one of the most modern and flexible gas-engine-based combined heat and power (CHP) plants in Europe.” At an event to mark this milestone, held on 7 March, representatives of Stadtwerke Kiel, Kraftanlagen München GmbH and GE unveiled one of the twenty GE Jenbacher J920 FleXtra gas engines, another step towards securing the district heating supply in Kiel after the coal-fired power plant is decommissioned on 31 March 2019. As well as multiple gas engines, the new coastal combined heat and power plant employs heat (hot water) storage in a 60 m high tank (30 000 m3 storage volume) and a 35 MW electrode boiler (providing power- to-heat capability), establishing a new benchmark in terms of flexibility, efficiency and sustainability. The new CHP plant, boasting an overall efficiency of 91%, will supply over 73 000 households and facilities in Kiel with district heating, as well as feeding power into Kiel’s 110 kV grid, which serves the state capital and some of the surrounding municipalities. Any excess power will be passed on to the wider grid. “Every one of the 20 gas engines ramps up to full load in less than five minutes. That allows us to react to changing grid situations at any time”, said Dr Jörg Teupen, director of technology, Stadtwerke Kiel. The output of the new gas-fired cogeneration facility will replace the electricity and heat previously generated by a coal fired power plant on the Kieler Förde, which has been in operation since 1970 – resulting in a 70% reduction in carbon dioxide emissions. The gas engine (piston) powered plant is being engineered and implemented by KAM and GE. GE is providing the engines, while KAM is the general contractor responsible for engineering, procurement, construction and commissioning of the turnkey facility, including the auxiliary buildings and integrating the heat storage and electrode boiler. The new plant is expected to start operation in the first quarter of 2019.